Competition for shrinking window of low salinity groundwater: Environmental Research Letters · October 2018, DOI: 10.1088/1748-9326/aae6d8: Our findings illustrate that groundwater stores are being depleted not only by excessive withdrawals, but due to injection, and potentially contamination, from the oil and gas industry in areas of deep fresh and brackish groundwater. The widespread distribution of unconventional oil and gas (UO&G) wells and other facilities in the United States potentially exposes millions of people to air and water pollutants, including known or suspected carcinogens. Childhood leukemia is a particular concern because of the disease severity, vulnerable population, and short dis- ease latency…We assessed carcinogenicity and evidence of increased risk for leukemia/lymphoma of these chemicals using International Agency for Re- search on Cancer (IARC) monographs. The majority of compounds (N 80%) were not evaluated by IARC and there- fore could not be reviewed. Of the 111 potential water contaminants and 29 potential air pollutants evaluated by IARC (119 unique compounds), 49 water and 20 air pollutants were known, probable, or possible human carcinogens (55 unique compounds). A total of 17 water and 11 air pollutants (20 unique compounds) had evidence of increased risk for leukemia/lymphoma, including benzene, 1,3-butadiene, cadmium, diesel exhaust, and several polycyclic aromatic hydrocarbons. Though information on the carcinogenicity of compounds associated with UO&G development was limited, our assessment identified 20 known or suspected carcinogens that could be measured in future studies to advance exposure and risk assessments of cancer-causing agents. Our findings support the need for investigation into the relationship between UO&G development and risk of cancer in general and childhood leukemia in particular. E.G. Elliott et al. / Science of the Total Environment 576 (2017) 138–147. This is an open access article under a creative commons license. New report (discussed here): Elliott, E. et al, “A systematic evaluation of chemicals in hydraulic-fracturing fluids and wastewater for reproductive and developmental toxicity,” Journal of Exposure Science and Environmental Epidemiology (2016), 1–10). …When methane emissions are included, the greenhouse gas footprint of shale gas is significantly larger than that of conventional natural gas, coal, and oil. Because of the increase in shale gas development over recent years, the total greenhouse gas emissions from fossil fuel use in the USA rose between 2009 and 2013, despite the decrease in carbon dioxide emissions. Given the projections for continued expansion of shale gas production, this trend of increasing greenhouse gas emissions from fossil fuels is predicted to continue through 2040. Dec. 2015: Large study finds methane emissions from oil and gas operations in Barnett shale 90% higher than government assumptions. Coverage and background in Inside Climate News. Major study cites extreme reproductive and developmental health effects likely from fracking. From the abstract: “UOG [unconventional oil and gas] operations release large amounts of reproductive, immunological, and neurological toxicants, carcinogens as well as endocrine disrupting chemicals (EDCs) into the environment that may negatively affect human health (8). The chemicals used in or produced by UOG have been linked to negative health effects, including adverse reproductive and developmental outcomes in men, women, infants and children. Aug. 2014: Maryland concludes fracking would have high likelihood of negative public health impacts, especially on air quality, healthcare infrastructure, occupational health, and social determinants of health. The report also concludes that fracking would have significant impacts on public health from cumulative exposures, frackwaste, and noise. Maryland currently has a moratorium on fracking. July 10, 2014: Concerned Health Professionals of New York just released a major compendium of the scientific, medical and media findings demonstrating risks and harms of fracking, including air, water, health, economic, and climate impacts, fully referenced and very current with over three hundred citations. The Compendium and its executive summary are available on the Concerned Health Professionals of New York website. New peer-reviewed research: Oil and gas wells and their integrity: Implications for shale and unconventional resource exploitation, Davies, R. et al., Marine and Petroleum Geology, in press, 2014:“Of the 8030 wells targeting the Marcellus shale inspected in Pennsylvania between 2005 and 2013, 6.3% of these have been reported to the authorities for infringements related to well barrier or integrity failure. In a separate study of 3533 Pennsylvanian wells monitored between 2008 and 2011, there were 85 examples of cement or casing failures, 4 blowouts and 2 examples of gas venting.”The article also notes that Ohio has Ohio 9500 unplugged orphaned wells and plans to plug 524 of them. Orphaned wells provide channels for movement of methane, frack fluids, and waste. Many of these are unmapped. Ohio does not monitor active, plugged, or abandoned wells for potential water contamination. Even plugged wells can become conduits, since the plugging is often unsound, especially historically and due to low Ohio standards. Note that the 9500 figure is probably a vast underestimate based on these numbers: the Ohio RBDMS database shows that Ohio has had at least 265,902 wells with around 70,000 operating wells. From 1965 – 2013, 41,928 wells were plugged, according to ODNR. Subtracting (~70k + 42k) from ~266k leaves more than 150,000 wells unaccounted for. Geochemical evaluation of flowback brine from Marcellus gas wells in Pennsylvania (Lara O. Haluszczak et al., Applied Geochemistry, 2012): “For total Radium (combined 226 Ra and 228 Ra) in flowback, the highest level reported is 6540 pCi/L.” EPA maximum contaminant level (MCL) for total 226 Ra and 228 Ra in drinking water is 5 pCi/L. Shale Gas and the Fairy Tale of its CO2 Reductions (8-12): “…Natural gas remains a net contributor of CO2, regardless of its comparatively low carbon intensity. This is due to the multiplicity of its uses. Unlike coal, which is primarily used for electricity generation, natural gas is used for generating electricity as well as directly in commercial, residential and industrial sectors. Therefore, when the price falls as it did during the shale gas boom, consumption of natural gas gets a boost across all sectors—not just electricity generation. 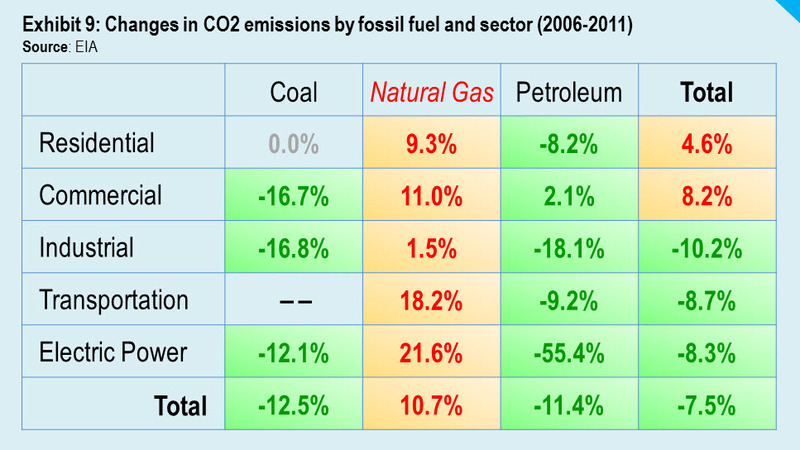 Sixty-six million metric tons, or 47%, of the increase in CO2 from natural gas occurred in commercial, residential and industrial sectors (Exhibits 7, 8 & 9) where natural gas isn’t necessarily displacing a dirtier fuel like coal. The 50 million tons it saved from substituting coal generation by virtue of its low price came at the cost of generating 66 million additional tons of CO2 from other sectors.Once we add in methane leakages to its CO2 emissions, natural gas could surpass coal in terms of its overall impact on our climate (Wigley 2011 and The New York Times 2011). Dallas, WV 2-23-13: National Response Center reports that 336,000 gallons of toxic, radioactive frack waste were released into tributary of Wheeling Creek when a valve was left open. Why can I not find any media coverage on this story?! Update 2-26: now covered by NBC Columbus, thanks to our tip. Why did it take Ohio activists to get attention to this disaster? Note: WV DEP apparently took Noble Energy’s word for the amount spilled. NBC therefore gives a much lower figure than the NRC report stated but still an outrageous 97,000 gallons of toxic, radioactive frack waste. No charges have yet been brought against the company. And WV media, apparently alerted by NBC Columbus, finally also picked up the story. New report on livestock diseases and deaths getting wide coverage: NBC News, NRDC mag, The Nation, and elsewhere. Great Sandra Steingraber piece: the case against fracking. Dallas, WV 2-23-13: National Response Center reports that 336,000 gallons of toxic, radioactive frack waste were released into tributary of Wheeling Creek when a valve was left open. Reported on Skytruth.org 2-22-13. Why can I not find any media coverage on this story?! Fracking the Eagle Ford Shale: Big Oil and Bad Air on the Texas Prairie, a multimedia report from Center for Public Integrity, Inside Climate News, and the Weather Channel(! ): full report here. “Emissions of the greenhouse gas methane due to human activity were roughly 1.5 times greater in the United States in the middle of the last decade than prevailing estimates, according to a new analysis by 15 climate scientists published Monday in The Proceedings of the National Academy of Sciences. Benzene and other air pollution surge with fracking in rural PA (2-13): “The DEP’s data show that drilling has brought large emissions to rural counties that previously had very little. Bradford County, for instance, had emissions of 261 tons of NOx in 2010, according to DEP’s air emissions inventory for that year. But in 2011, emissions of NOx from the shale gas industry climbed to 2,621 tons. Joe Osborne, of the Group Against Smog and Pollution, says that for people close to the wells, the largest concern is not so much ozone precursors, but hazardous air pollutants. Bloomberg.com, 2-8-13, reports that gas and oil production is the second biggest greenhouse gas (ghg) emitter. [Note: the USEPA data underestimate the actual ghg from fracked gas and oil by not using the latest scientifically based numbers on methane’s global warming potential. See Howarth et al. Methane Emissions from Natural Gas Systems, listed below. January 2016: New report (discussed here): Elliott, E. et al, “A systematic evaluation of chemicals in hydraulic-fracturing fluids and wastewater for reproductive and developmental toxicity,” Journal of Exposure Science and Environmental Epidemiology (2016), 1–10). British study on health impacts of noise pollution from Heathrow airport has implications for fracking. Though these connections are not discussed in the article, the documented associations between noise and health are relevant, given the extended high-decibel noise from compressors, flaring, truck traffic, and other frack industry processes. Deadly Gas Industry Coverup Revealed by NC5 KREX News Room by John Dzenitis 8-5-11: “Before 42-year-old Jose Lara of Rifle died, he recorded a six-hour deposition detailing his work in the natural gas industry. OSHA and NIOSH issue worker silica hazard alert. UPenn Law discussion of alert. Given the recent death of 7500 migrating birds in New Brunswick in one night (“managers at the liquefied natural gas import facility estimate that about 7,500 migrating birds, mostly small songbirds, were drawn into the flare and died from its heat“), the cost of fracking alone to bird mortality must be better assessed.